UL 181A-P & UL 181B-FX Listed. High performance acrylic adhesive resists mold & mildew growth. Adhesive is protected by bleached Kraft liner. Improved shear and peel adhesion. Excellent cold weather performance and performs in hot, humid weather as well. 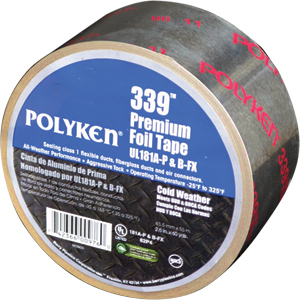 Suitable for installation temperatures as low as -10 degrees F.
Recommended for use on rigid fiberglass duct board and rigid sheet metal duct in accordance with manufacturer instructions. Class 1 flexible duct sealing. Insulation seam and patch. Dryer vent seals.